On Friday 29th April SPERI, Policy Network and FEPS organised a one-day workshop entitled ‘Diverging Capitalisms, Part 1: the City After the Crisis’. 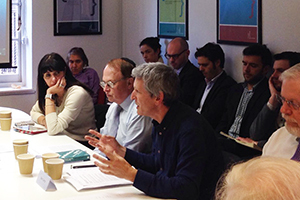 The workshop, organised by SPERI’s co-director Professor Colin Hay, Dr Arianna Giovannini (SPERI) and Renaud Thillaye (deputy director, Policy Network), was the first of a series of four Events|News as part of the project ‘Diverging Capitalisms? 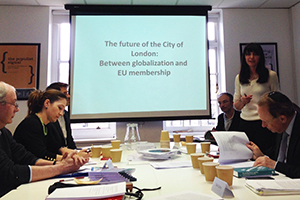 Britain, the City of London and Europe’, a join venture between FEPS (Foundation for European Progressive Studies, Brussels), Policy Network, and SPERI. The aim of the project is to consider the changing nature of the British economy, its place within the European economic space and the consequences of a possible ‘Brexit’. The event brought together academics, policy makers and practitioners from across the UK and Brussels to discuss the changing nature of the City of London after the crisis, and its changing relationship with both the UK economy and the EU/European economies, whilst also considering possible post-referendum scenarios. Two interactive sessions based on research contributions by Dr Helen Thompson (University of Cambridge) and Professor Leila Simona Talani (King’s College London) were followed by a policy-makers and commentators panel discussion with Dan Corry (Chief Executive of NPC), Professor Nicholas Dorn (IALS) and Graham Bishop (consultant on European integration & financial affairs). The programme for the day is available here. This opening event will be followed by three workshops that will focus on: i) European economic governance after the global financial crisis and the Eurozone crisis (London, 28 October 2016); ii) British capitalism and European capitalisms – their different and common developmental trajectories (Brussels, April 2017); iii) putting the outcome of the Brexit referendum in context and discussing the findings of the project (November 2017). If you wish to receive more information about the forthcoming Events|News, please contact Dr Arianna Giovannini.